Just like many NQT’s, trainee teachers or perhaps teachers switching to second subjects, this September I am preparing to teach a subject I haven’t really taught before, today I began planning for my first lesson next week with a sense of real excitement and if I am to be completely honest of a small amount of anxiety. However after opening up an email from my new Head of Department (technically I am still his boss outside of these lessons) any feelings of anxiety and nervousness slipped away. As a new member of his department I have been given access to a new, refreshed and updated scheme of learning, with all the resources I need week by week including a big picture overview. It means I have now spent the time today adapting the resources provided to be personalised for my new class in the way that I want to deliver it, it has considerably reduced my workload for preparation and planning and even better as the resources will be shared via Google Drive as a team of teachers we can share ideas and continue to collaborate and support each other’s practice over the next academic year. It made me reflect on what it was like starting out as a trainee and NQT fifteen years ago, the majority of teachers that surrounded me had their OHT’s (these were overhead transparencies) please google if you are too young to know or their worksheets that they had created many years ago and wouldn’t dream of letting you have a proper look at them let alone have a copy in case you stole their ideas. I quickly gave up asking if it would be possible to have a copy following one conversation that ended abruptly and followed by a long silence in a packed prep room at break time. In those days it certainly was rarer for teachers to work together and collaborate, to share the load but it did still happen. These days I am pleased to hear in many schools it is different, I am fortunate to work in a school with fantastic teachers who pride themselves on their professional generosity, that value and seek the support and challenge of other colleagues through collaborative working, who fully understand the benefit this can have to reducing their workload, pedagogy and more important the quality of learning for those they teach. I do wonder though is this now the norm in schools? Do you work in a department or school that do collaborate and have professional generosity? I would be interested to hear of examples that do and don’t. We need more of this approach in our profession and with technology the collaboration and professional generosity can be even further reaching. 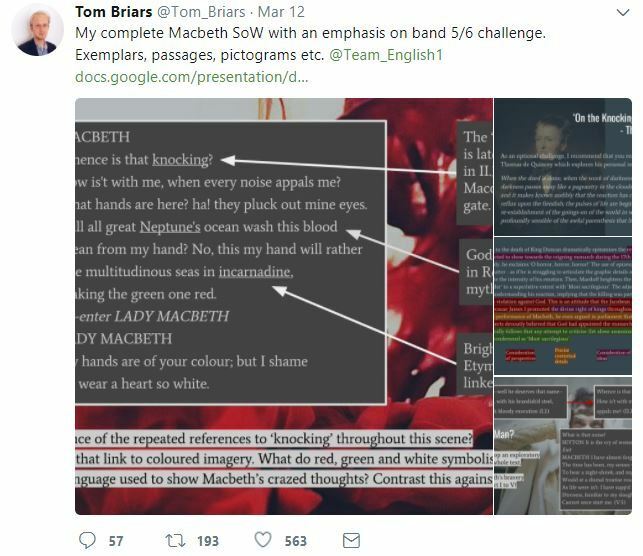 A great example of this is another teacher who I am fortunate to work alongside @Tom_Briars and the approach of @Team_English1 if you look at the picture at the top of this blog, Tom’s approach typifies the art of professional generosity, sharing hours and hours of hard work to benefit other teachers, through using Twitter the scheme of work has been adapted and taught in thousands of English classrooms up and down the country. It is pleasing to see more and more subject networks like this come together from the grassroots and we need more of it. Finally the other side of professional generosity I think we need to do more of as teachers is to credit those around us that give us ideas or help contribute to plans and resources that we then use in our own classrooms and more importantly make it known to them that they have inspired you and supported you. Thank you to my new Head of Department @alanjenkins77 who has saved me at least three hours of work this weekend through his strong leadership, promoting and encouraging a culture of professional generosity in his department (albeit I was inspired to spend 40 minutes of that gained time writing this blog). Are you about to teach a new subject for the first time? How are you feeling about it? Do you promote professional generosity in your work? Have you any examples to share?